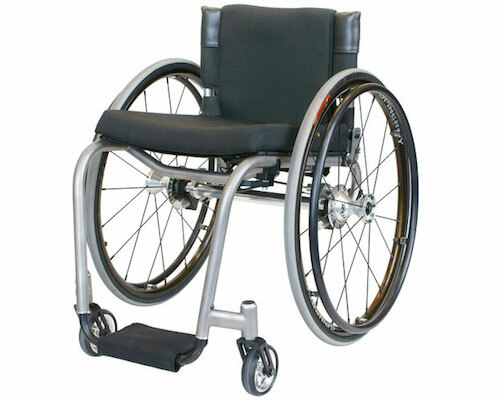 FIXED FRAME SUPER LIGHT EVERYDAY WHEELCHAIR. This wheelchair is NOT available to people over 80kg. The Melrose Cobra is an everyday lightweight wheelchair designed and built to provide a comfortable ride by reducing jarring and vibration. This has been achieved this by utilising the low elastic modulus (springyness) of the titanium frame. Cobra is their lightest wheelchair made from titanium, the lightweight construction reduces stress and wear on your arms and shoulders. The design also has no underframe, this assists when lifting the wheelchair over yourself – for example: when getting in a motor vehicle without a hoist. There is also a small amount of camber bar position adjustment so you can change your wheelchair balance position.